Akar Kessel, a weak-willed apprentice mage sets in motion events leading to the rediscovery of the magical device, the crystal shard. But is it merely an inanimate device . . . or is it capable of directing the defeat of Ten-Towns? Or have the barbarians already arranged for that themselves? Their brutal attack on the villages of Ten-Towns seals their fate, and that of the youn barbarian Wulfgar. Left for dead, Wulfgar is rescued by the dwarf, Bruenor, in exchange for five years of service . . . and friendship. With the help of the dark elf, Drizzt, Bruenor reshapes Wulfgar into a warrior with both brawn and brains. But is Wulfgar strong enough to reunite the barbarian tribes? 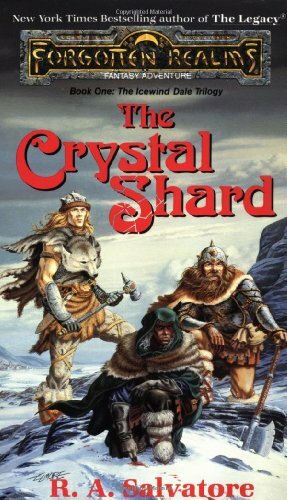 Can an unorthodox dwarf and renegade dark elf persuade the people of Ten-Towns to put aside their petty differences in time to stave off the forces of the crystal shard?